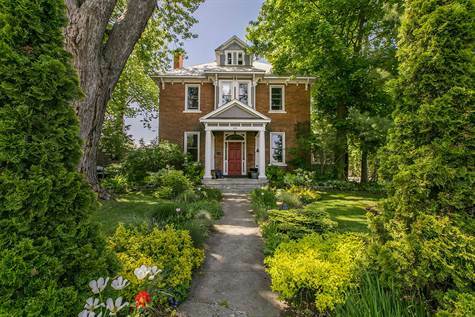 Garage: Single, Attached "Inside entry to mud/laund"
Year Built: 1860 "GORGEOUS DETAIL"
EXECUTIVE RENTAL - STUNNING century brick 4+ BD, 2 BTH on HUGE 75'x150' lot, creatively landscaped front, back & all sides...then there is the inside! Soaring 10' ceilings, original tall solid WD trim, fabulous architectural detail, original stained glass French doors, hardwood FLRS, & fantastic floor plan! Open LR to DNRM off of spectacularly updated Urban Chic gourmet kitchen w/radiant barn board TILE FLR, polished concrete counters (SENSATIONAL), funky subway tile backsplash, farmhouse porcelain double sink, high-end stainless appliances & 'En Provence' style WHITE custom cabinetry! Wait, there's more: large FR off kitchen (Entertaining +++), leading to a relaxing screened in 3-season sunroom/porch. Main FLR laundry/mudroom off garage entry. 2nd floor has 4 large BDRMS, master walk-in, office, storage RM (or 2nd floor laundry), gorgeous BTH w/claw foot & walk-in shower, & 3rd floor loft TBD! Basement workshop & privately FNCD backyard oasis w/custom shed, pond, patio. Available to rent Nov 1st, 2016. $1850 per month (plus utilities), minimum 1 year lease.